We recently installed a huge new front door (I'll write a separate blog about that project soon), and I suddenly found myself in need of a much bigger wreath to mark the start of the autumn months. 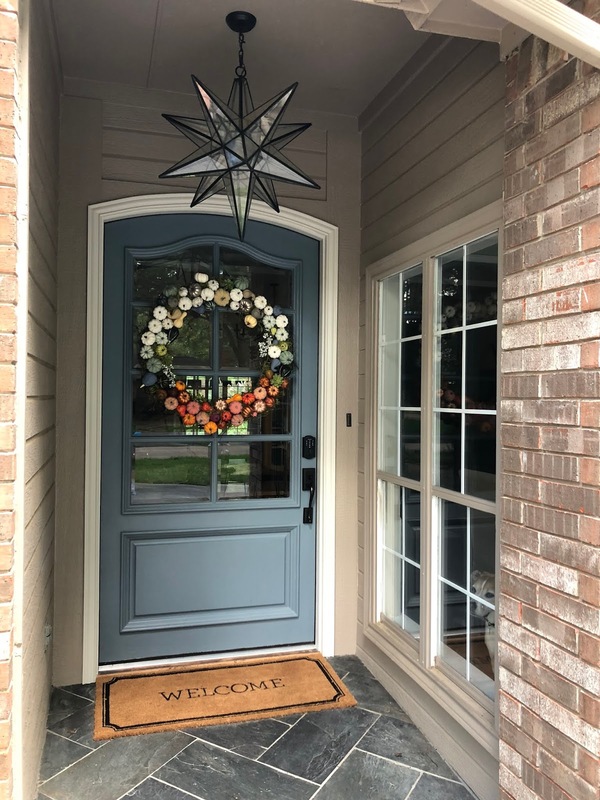 I searched online for quite some time, hoping to find the perfect 30" wreath that didn't cost a small fortune, but I couldn't find anything that was worth the cost. I had an idea of what I wanted and couldn't seem to find it anywhere, so I finally decided to just make it myself! I wanted something colorful that exuded the happiness I feel during the fall season. When the temperatures start to dip and we start marching toward Halloween, Thanksgiving and the holiday season, I just feel so happy! 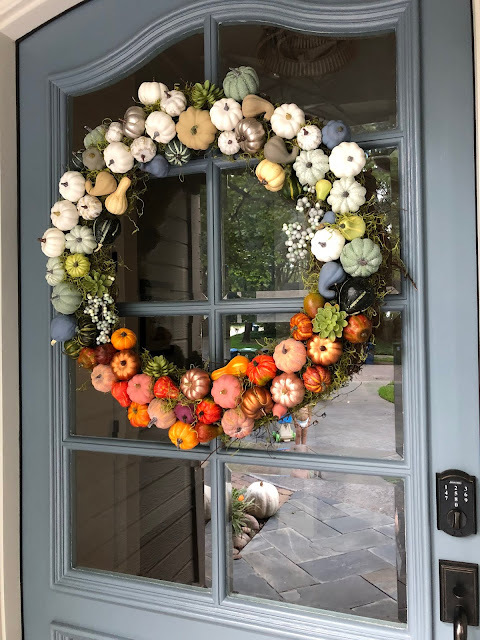 I wanted this wreath to make us smile every time we walk in the front door, so I focused on incorporating joyful colors into the normal autumnal scheme to give our wreath a unique touch. I already had a bunch of tiny faux pumpkins that I'd collected over the years, so I started with those. Then I found several more boxes of decorative pumpkins at Target that really got the color scheme going in the right direction. 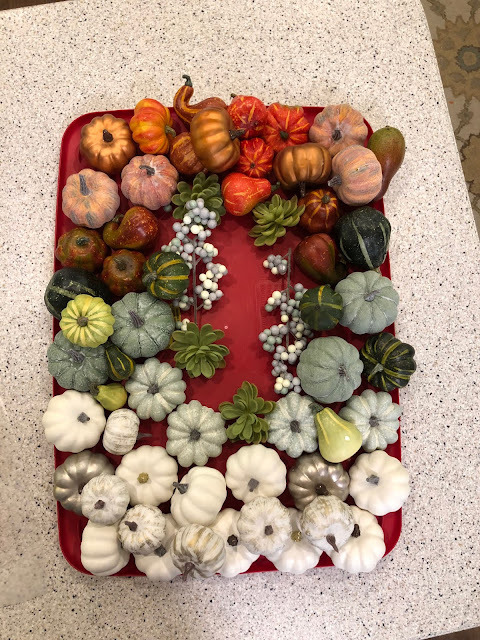 I bought a box of these harvest metallic pumpkins, a box of little white pumpkins and then this awesome mix (that I can't for the life of me find on the Target website) that included white and green pumpkins and some faux succulents. I knew I wanted to paint some of the pumpkins to be colors not found in nature, so I grabbed some acrylic craft paint and played around with the color schemes on my dining table before I got started. 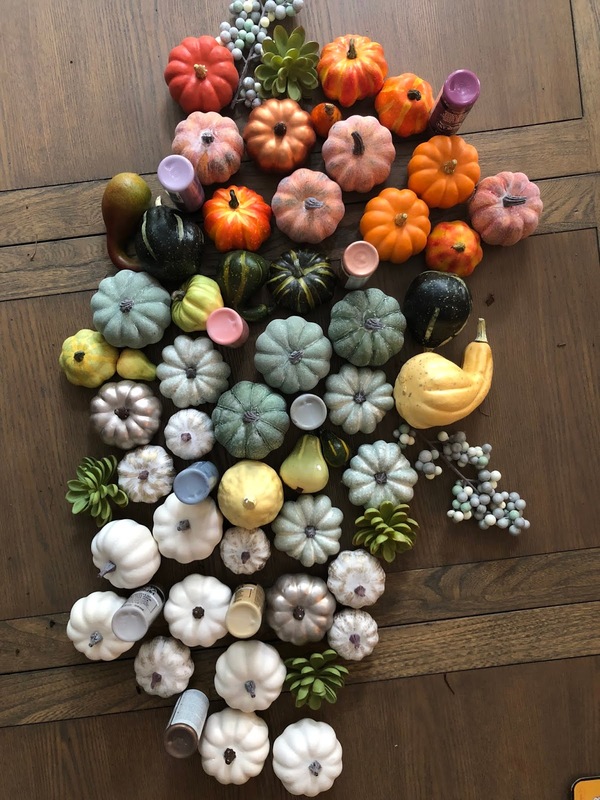 This photo shows all the faux pumpkins we had to start with, plus the craft paints thrown in for good measure. This is when I decided the ombré effect was going to work, even with the brighter colors thrown in. 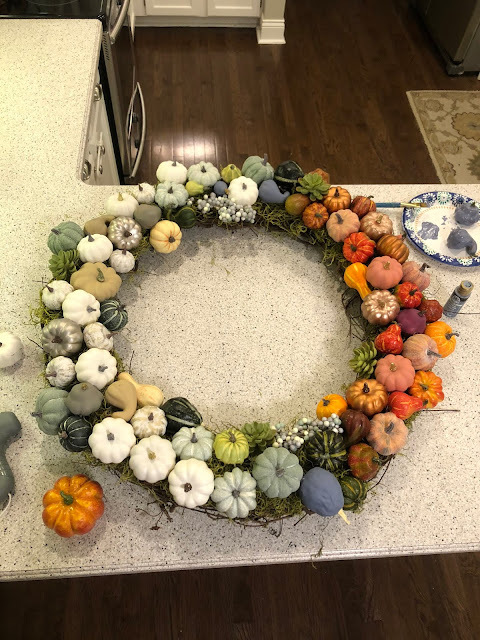 At this point I was super jazzed about the project and couldn't wait to get started putting the actual wreath together! 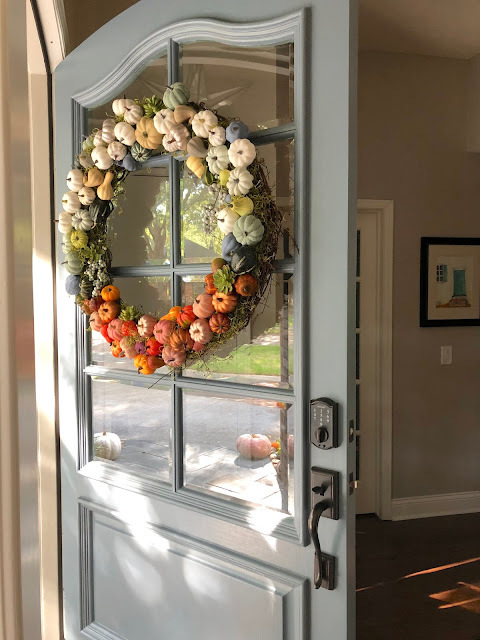 I picked up a 30" grapevine wreath and some bright green spanish moss (both from Hobby Lobby) to serve as the base for the wreath. Both of those things are really affordable, especially if you catch them on sale or use the 40% off coupon that Hobby Lobby always offers on one regular price item. A little goes a long way; I bought the big bag at the store and only used about 25% of the bag. 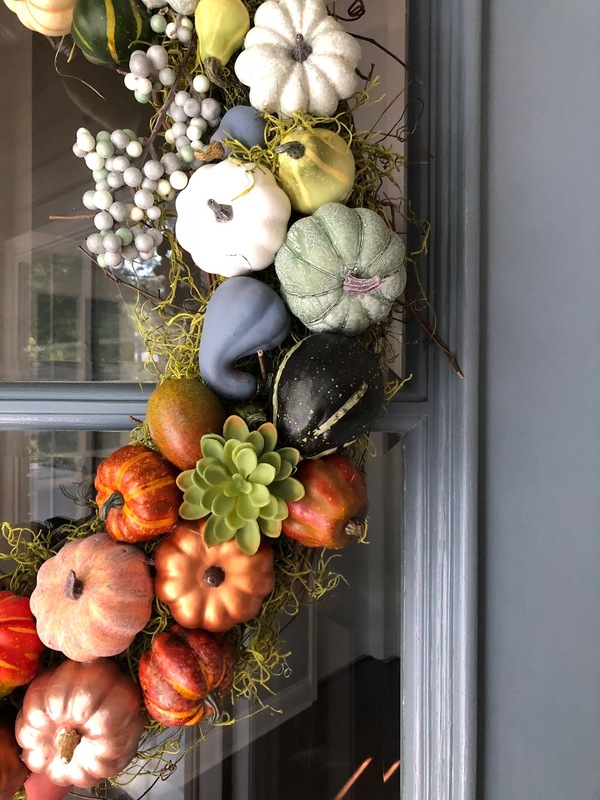 Our local Hobby Lobby had two options for the color, and I went with the brighter green color because I knew it would set off my colorful pumpkins better than the more muted, grey-green color. Totally a personal preference! 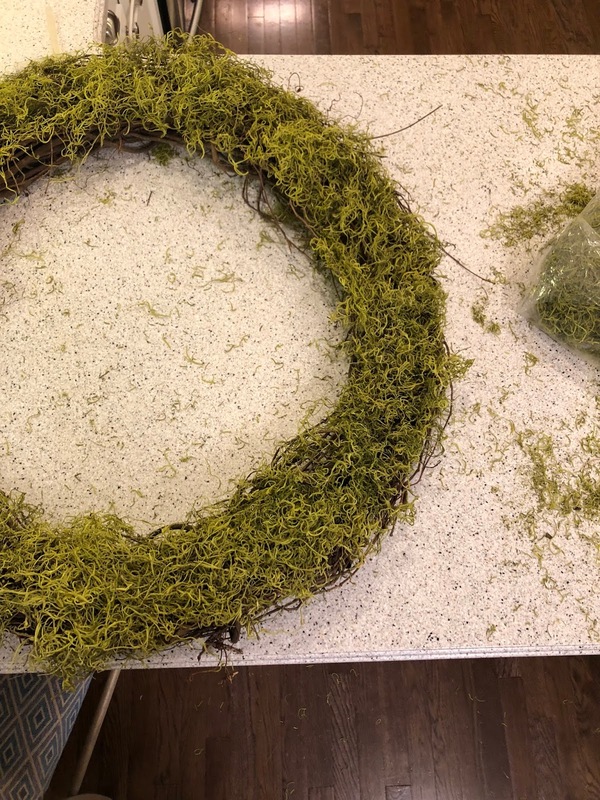 The moss attached to the grapevine wreath really easily. It naturally just sort of grabs on to the sticks of the wreath, but I added some hot glue just to make sure the moss was secure. Then it was time to paint my pumpkins! 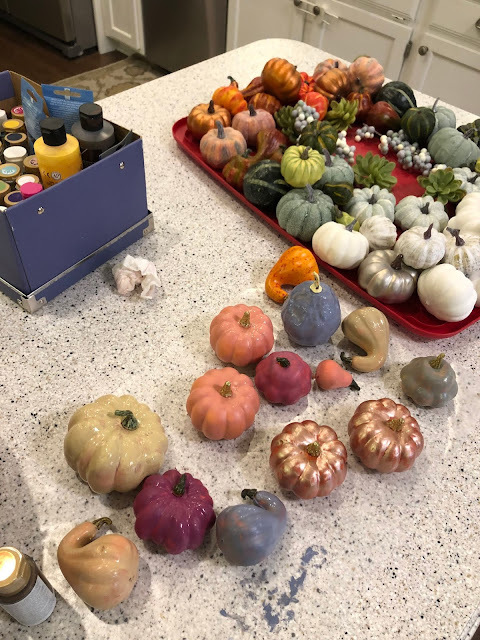 This is a quick snapshot I took of the pumpkins before I painted any with my craft paints, just to see the way the colors worked before I incorporated more of my own fantasy colors. I chose to paint some of the pumpkins beige, grey/blue, rose gold, pink and purple. 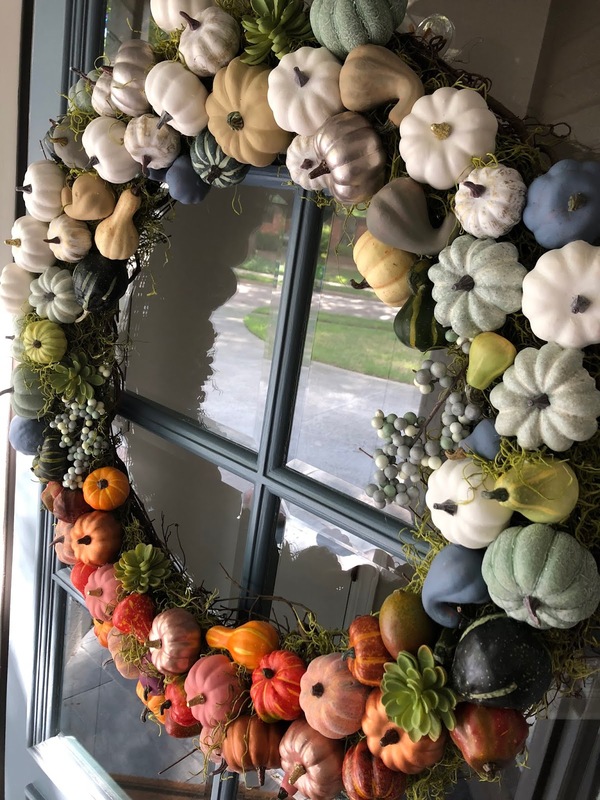 I was stealing time to do this project late at night and during naps, but the kids had an absolute ball playing with the pumpkin wreath pieces before I put it together. 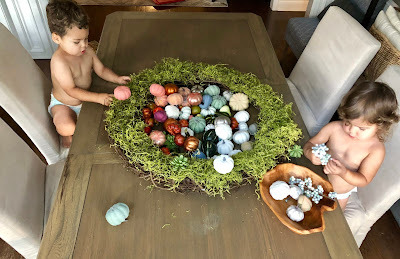 It was worth letting them play with it because now they get so excited each time they see the wreath; they feel like they helped me make it and that makes them so proud of it. 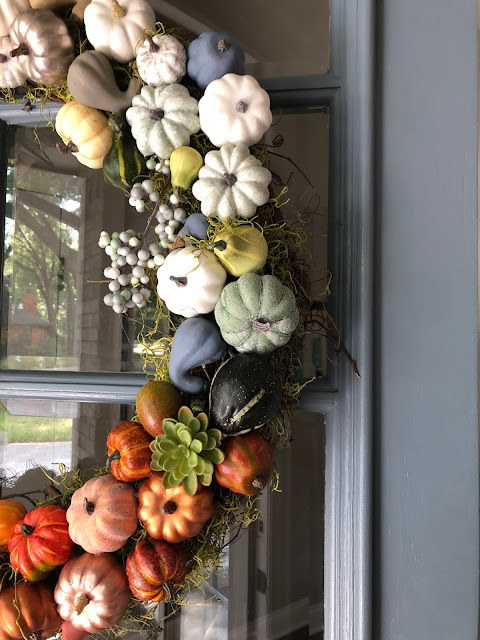 Once those painted pumpkins were dry, it was time to start glueing the pumpkins on the wreath. I started with the white side of the wreath and gradually worked my way around, arranging the pumpkin puzzle pieces to be just right. I hot-glued the pumpkins both to the moss base and the other pumpkins for extra stability. Once I was done with my pumpkin puzzle, I couldn't wait to hang it on the door. It's just the right size to set off our new door! I don't get to create as many projects these days, but it feels SO GOOD when you have an idea in your head and you actually get to bring it to fruition. PS. 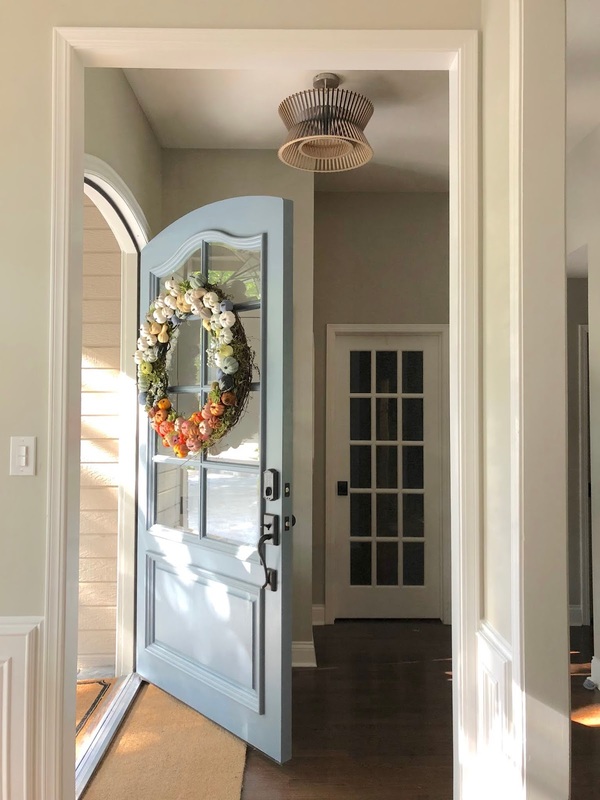 I'll be back soon with a mega blog post about replacing our regular front door with this huge, beautiful door that we found for $100 at our local Habitat for Humanity Restore. It was quite a process but it was so worth it! I can't wait to tell you about it.